Normally when you’re talking about a couple of former Cy Young award winners having a rare season, it’s a good thing, but in this case, it’s just the opposite. Both R.A. Dickey and David Price, who won the Cy Young last year, are off to poor starts this season, putting them with in line to join elite company. Just five times since 1967, when the Cy Young award began to be given out to a pitcher in each league, have two first-time winners in the same season gone on to have poor seasons the next year–the award originated in 1956, but was given out to just one pitcher each season until 1967. The select group of players who won their first Cy Young awards only to go on to have poor next seasons include: Jim Lonborg and Mike McCormick, in 1967; Hall of Famers, Steve Carlton and Gaylord Perry, in 1972; John Denny and LaMarr Hoyt, in 1983; Willie Hernandez and Rick Sutcliffe, in 1984; as well as Bob Welsh and Doug Drabek, in 1990. While it’s looking like Price and Dickey may join them, it’s still far too early to count them out just yet. They’ve proven to be too good of pitchers. But it’s something worth looking at, nonetheless. R.A. Dickey became the first knuckleballer to win the Cy Young award, last year, when he went 20-6, with a 2.73 ERA, however, so far this season he’s experiencing far less success, going 2-5, with a 5.06 ERA, through his first eight games pitched. The one thing that’s most noticeable for Dickey this season is that his knuckleball doesn’t have the late, drastic movement it had last year. Unless he finds a way to get back on track, I don’t see Dickey having a very good season, as the knuckleball doesn’t leave much room for error. David Price became the first Rays pitcher to win the Cy Young award, in 2012, going 20-5, with a 2.56 ERA, but he’s been struggling this year, having gone 1-3, with a 4.78 ERA, over his first eight games of the season. Price had a decent start his last time out, but his command just doesn’t seem to be there this season, for one reason or another. I could see Price having a better overall season than Dickey, however, if he doesn’t figure things out, Price is likely to still have a disappointing 2013. 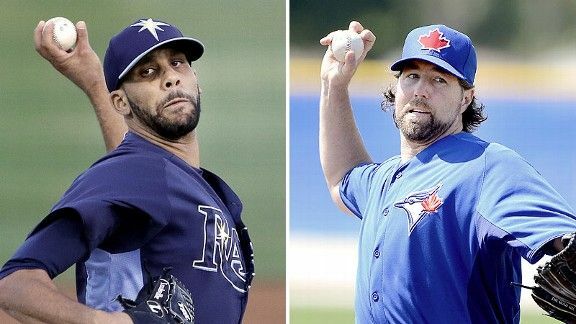 Whether or not R.A. Dickey and David Price can turn things around is something that only time will tell. If the first month of the season is any indication, it’s not looking all that promising, but these kind of things are unpredictable; part of what makes baseball such a great sport. This entry was posted in Dailies and tagged 2012, 2013, AL, American League, Baseball, Bob Welsh, Comeback, Cy Young Award, David Price, Doug Drabek, Gaylord Perry, Hall Of Fame, Jim Lonborg, John Denny, LaMarr Hoyt, Mike McCormick, MLB, National League, NL, R.A. Dickey, Rick Sutcliffe, Steve Carlton, Willie Hernandez by Matt Huddleston. Bookmark the permalink. Yeah, I’m not counting out Dickey yet. The Jays have been struggling for sure, but there’s lots of baseball left. He’s got a great biography by the way.